Read a dad’s personal account about the journey through the adoption process to become a father for the first time. I can’t remember exactly when adoption occurred to me, but I remember thinking about it as far back as my early twenties and the more I thought about it, the more sense it made. We were in our mid twenties when we started thinking about how we wanted to start our family and I spoke to my wife about adoption. She told me what I expect most people think, that she had never actually considered it, she just assumed we’d have children in the traditional way. We weren’t planning on kids for a few years and it meant a lot of meaningful conversations about our family’s future. I felt at that point the decision was made. So we had a plan, we’d have a child in the traditional way and then when our child was a few years old we’d follow up adoption. Having settled on the how (or so we thought) it was just a matter of when. Thankfully this was decided when we started seeing posters around Edinburgh about adoption. So we contacted Edinburgh City Council and were sent information packs and invited to an open evening. We were a little nervous and excited about going along, but also curious. I still remember the evening in November, looking around at all the people there. We entered the main hall and were immediately approached by a young woman who offered a drink and a chat. She introduced herself as Jen and, thankfully, started the conversation. She told us the basics of the process of adopting, why a child can be taken into care, a little of what to expect, some of which we knew, some of which we didn’t. The meeting only confirmed what I wanted, I wanted to adopt and my wife agreed. It was time to get started. It began with a phone call to arrange a home visit to discuss in more detail what would happen if we were still interested and we arranged it for January. The night came along and we were delighted to see it was Jen from the open evening who’d been assigned as our case worker. The prep group started at the end of April. It was a lot to take in and filled with lots of useful information, but the thing that I found most useful was talking to the other people taking part in the group. We still keep in touch with the group and have become close to one couple in particular. Having the group to talk to helped so much in terms of making us feel less isolated. With the end of the Prep Group came another break. The home study meetings started in August and went on for a few months. Meetings covering every aspect of our lives: details about ourselves, our relationship, our families, friends, jobs, finances, history with children and so much more. And then there was the talk about the children. This for us and the other couples we knew from our prep group, was the most difficult, awkward and upsetting part of the whole process. I called it The Checklist. Basically it’s a list of all the potential issues a child could have and it was up to us to decide “would consider”, “would not consider” and “would maybe consider”. Hearing the list itself was upsetting enough but having to decide was very difficult. I don’t think I’ve ever felt so selfish, but when you think about it you have to be. After that we had our Xmas break then began meetings again to round off our application, review it and amend errors. Finally the forms where done, the assessments, matching criteria, family trees, personal statements, support networks, family history forms and your relationship history. All that was needed now was to collate the data and wait for our meeting with the adoption panel. Jen had already been proactive in booking it and it was set for the end of March. She was great at prepping us for it and letting us know what to expect. When the day finally came, we were a little nervous, my wife more than I. We arrived early and had a quick chat with Jen; she wanted to check we were ok and had no questions. Then we were called in. There were five people around the table and us and Jen at the other side. The Chair introduced herself and her colleagues and explained the format and what the meeting would entail; nothing we didn’t already know. They went round the room and asked questions from reviewing our application forms. The questions weren’t anything we couldn’t’t handle. Then it was done and we were asked to wait in an adjoining room while they reviewed and came to a decision to make a recommendation to the Agency. We’d barely sat down and started talking, before we were called back in; I think it was less than three minutes. The decision was unanimous and even though it was expected, we were still relieved and obviously happy. After the Panel Meeting we were on a massive high. Jen was very careful to point out that the waiting period, in the most extreme circumstances, could take years. So we hunkered down and got on with it. A big part of our home study meetings was childcare arrangements and what that would look like. I’d already discussed it with my wife and once again it made sense for us as a family for me to take time off. My company’s policy for adoption leave was great and was better than my wife’s. My wife’s career was much more successful than mine, and taking a considerable time off would affect her position upon returning. My job on the other hand, was guaranteed and the company made a point of being family friendly. I’d approached my employers in January to let them know of our decision to adopt and how the process worked and it was sorted quickly. Everything was in place: the process completed as much as could be, We knew Jen would do everything she could to find a perfect match for us, but it was up to us to hear all the details and decide whether to move forward. When we passed the panel we were told to not plan anything more than two to three months in advance, because things can move that quickly. So we settled in and planned little things: holidays, birthday celebrations and pretty much any other reason to celebrate we could find, while always in the back of our minds, thinking about the inevitable adoption phone call. Then something unexpected happened, something almost unheard of. I got the call. You may be thinking how could it be unheard of, but what I haven’t mentioned is when the call came. We were signed off by the Council decision maker at the end of March. It wasn’t long after that, we started to adjust to the wait, but it didn’t actually happen that way. The call came on a Monday morning, the NEXT Monday morning – only 5 days after being signed off. Jen arrived and thankfully she didn’t keep us waiting. She had with her a detailed file about a child she had matched us with. She started reading through the detail and we listened intently. It was a lengthy file, but she managed to streamline the detail for us. I remember her asking what we thought and my response was simple: “Sounds a bit too good to be true”. My wife had the same reaction and that decided what was going to happen next, we were moving forward to matching. After going through such a lengthy process and preparing yourself for the wait it was a shock to the system to have things happen so quickly. That was only the beginning; Jen explained that due to certain time constraints, there was a likely chance the child would be moved to us within six weeks.So dates were drawn up and a timetable put in place and we had a meeting a week with various individuals until the match was approved. We then found out that if the match was approved, we’d meet that week and the child would move in with us the very next week after. To say it was a bit overwhelming was an understatement, but this was it for us and we anxiously waited for the result of the matching panel with only six weeks to go. Our employers were informed of the change and our families as well, and what we thought would be a year of unknowns turned into six weeks of frantic panic. Most (people having children) prospective parents get 9 months to prepare for their arrival, we had 9 days! Being an organized man, I had spent a lot of time over the previous weeks looking into all we’d need for a child and bookmarked it all on our computer. So I went home and ordered everything. Turns out, thanks to the internet, you can get everything you need for a baby in less than a week. The only exception was the bedroom furniture which would take 6 weeks, so I got a second hand set from Gumtree, I spent the next day clearing and setting up the room and when the items came, it was sorted. The first meeting was surreal. The council had organised a phased introduction, meaning we’d meet for a short time at first and gradually increase the amount of time we spent at the foster carers. They were very experienced, warm and welcoming so had us at ease from the moment we met them. They took us through to the living room and that’s when we saw her. So small, so beautiful, this was it. We looked at her with massive smiles and it took everything to contain myself, to not run over. Nothing will beat the feeling we had when she reacted to us; she was smiling and squealing with delight. It’s a moment I can picture so clearly and one that I don’t think I could ever forget. I couldn’t take my eyes off her and the foster carers were quick to hand her over. I let my wife take her first and the smile on her face said it all, it felt amazing. They started telling us all about her: likes, dislikes, and games she liked, her routine and anything else they could think of and before we knew it our time was up. She came to ours and was just as happy and smiley as she was when we first met her – it was just amazing. The final phase of the handover period was the final pick up. To say goodbye to a child they’d been looking after and caring for some time was, unsurprisingly, very difficult for the foster carers. We decided to make it quick; we’d pop in, pick her up and leave so as not to drag it out for them. They agreed that this was the easiest way for them too. And then it was done, we were driving home with our amazing daughter and she was with us. I’d like to say that was the end of the process, but the legalities of adopting are more complicated than that. We were technically her foster carers too and we couldn’t apply to have her become our daughter (or us to become her parents) until she’d been with us for at least 13 weeks. During this time we’d have spot checks with various social workers to see how we were getting on. When the 13 weeks had passed we made sure to contact the Council and get the relevant paperwork submitted to have us legally become her parents. The court day was unforgettable. The court experience was probably the most important moment of our lives. We went in and sat down, the sheriff asked us a few questions, told us everything was in order, and that was it. It took barely five minutes, no big announcements or decrees. We left feeling a bit stunned, thankfully not too stunned to get our “first” family photo. That was it. Our adoption experience. 25.5 months from our first enquiry to being signed off in court – quicker than your average time for the whole process. The others in our group waited a lot longer and some had some more complicated and heartbreaking stories. We were and are so happy. I can’t imagine how things could’ve been better. Our daughter is amazing, still so happy, so smart and growing up so quick. I recommend adoption to everyone. The process is long, but it gives you time to think and more importantly reflect on whether each stage of the process is right for you, or whether children are right for you. I can honestly say it prepared us so much more than natural means seem to and I honestly believe, it has made me a better person, better husband and better father to our daughter. 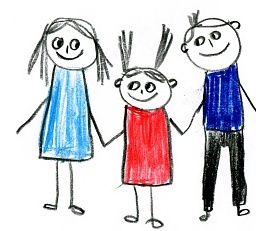 For more detailed information on adoption and permanent fostering please read our guide to becoming an adoptive parent (PDF) which takes you through the steps to becoming an adoptive parent and has an easy to read question and answer section. You can also contact our adoption team on 0800 174 833. Our experienced social workers are ready to take your call.